CLEMSON, SC – After putting on probably the greatest receiving performance in Clemson history in the Orange Bowl, Sammy Watkins was asked if he’d consult his coaches and family about whether to forgo his senior season for the NFL draft. “It will be a real short conversation, if he’s going to talk to me,” Tiger head coach Dabo Swinney interjected to raucous laughter. Truth be told, although he gave noncommittal responses for weeks about his future in order to keep the focus on the team, Watkins’ departure for the NFL had been all but a foregone conclusion for some time. It even became a running joke between him and his head coach. Watkins made his decision official with a news release Monday, and Friday, he met with the Clemson media for one last time to express his gratitude to his coaches, teammates and fans. Watkins admitted that he didn’t even submit paperwork to the NFL Draft Advisory Committee to ascertain a draft grade, as it was pretty clear to all involved that he is certain to be selected early enough to warrant his decision. And he was certainly both of those things during his time at Clemson. Watkins leaves as the school’s record holder in receptions and receiving yards on a game, season and career basis. Even though he played just three years, he set 23 school records. Of all his records, Watkins said being the only player in the country with two catches of at least 90 yards this season – a 96-yard touchdown at Virginia and a 91-yarder at Syracuse – was the “highlight of (his) career.” He also had touchdowns of 77, 64, 48, 44 and 41 yards as a junior. Watkins put an emphatic exclamation point on his career as he was named the Most Outstanding Player of the Orange Bowl. 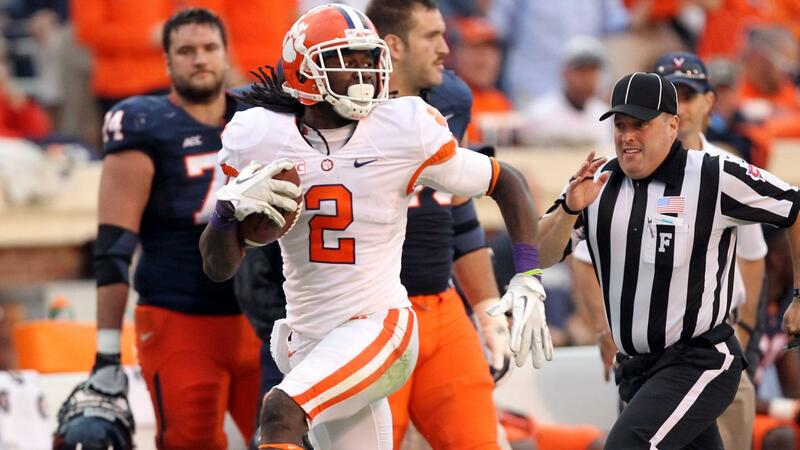 He had 16 receptions for 227 yards and two scores in Clemson’s 40-35 win over sixth-ranked Ohio State. Once the game was over, Watkins admitted it sunk in quickly he had played his last game as a Tiger. Watkins said he will now turn his focus toward training in Tampa, FL, for the draft. He still has a semester and a half left to finish his degree in Communication Studies and said he plans to return in the offseasons to complete his undergraduate work. He was specifically referring, of course, to Watkins, who became just the fourth first-year freshman in NCAA history to earn AP First-Team All-America honors, joining Herschel Walker (1980) of Georgia, Marshall Faulk (1991) of San Diego State and Adrian Peterson (2004) of Oklahoma. Watkins finished his career with 240 receptions for 3,391 yards and 27 touchdowns. The first two totals are Clemson records and the touchdown total tied that of former teammate DeAndre Hopkins, who is now with the Houston Texans of the NFL. More importantly, the Tigers had a 32-8 mark during Watkins’ time on campus and capped his career with the school’s first BCS bowl win. “I don’t think if I would’ve gone to any other university, I would’ve gotten what I got at Clemson,” he said. “I not only got football, but I met a great group of guys that came from different places. We had one common goal, and I think we accomplished a lot in these three years. This program has been growing since I got here, and the coaches have done a great job of creating a culture.